Update:As of March 2018, the Tuck Mattress is no longer available. Interested in a new mattress but not sure what type of construction is best for you? Tuck offers a personalized mattress construction based on a short questionnaire on their site. This is my first time trying a Tuck mattress, so I was interested to see how the mattress built from my responses turned out. Read on to learn more about the customizable mattress from Tuck! If you’re in a hurry you can click here to skip to the review summary. There are many variations on the construction of the Tuck mattress because they build personalized mattresses. 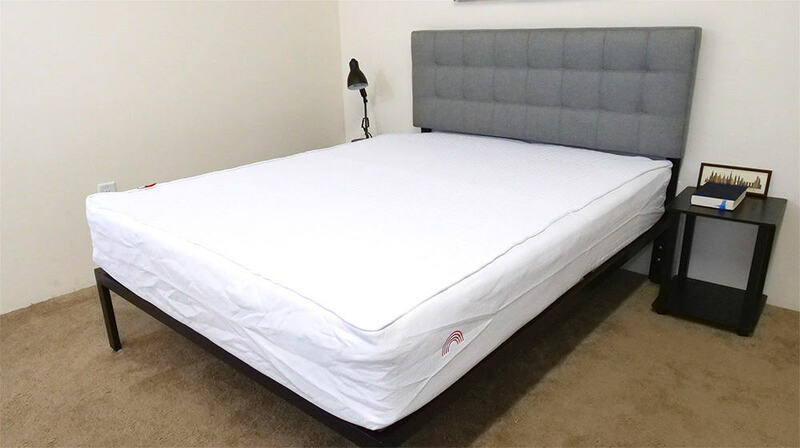 Tuck uses a combination of copper infused gel memory foam, latex foam, microcoils, pocketed coils and two types of poly foam in their mattresses. By changing the positioning and use of these layers they are able to create different feels depending on your sleep preferences. I should also point out that Tuck offers the opportunity for a split construction for queen size mattresses and above. This means that the bed can have different constructions on either side if you and your partner have different preferences. At the end of the Tuck questionnaire they provide reasons for why they constructed your mattress in that manner. For my Tuck I was told that the feeling and support of the mattress were placed in the medium range as my body composition is about average. The construction also took into account the fact that I tend to sleep a bit hot and I constructed this mattress to sleep alone, so there was less emphasis on the ability to isolate motion transfer. Cover – The cover for all iterations of the Tuck mattress is made of a mixture of rayon and polyester. I found it to be pretty thin, so it won’t interfere with the feel of the layers below and also allows for some breathability. Tuck covers also uses a type of yarn called REPREVE, which is composed of recycled water bottles. Comfort Layer – The comfort layer of my Tuck mattress is consists of copper infused gel memory foam (3.5 lb density, IFD 5-15). Memory foam allows sleepers to sink into a mattress for pressure relief and provides a contouring feeling. Some memory foams have a reputation for trapping body heat, but the copper infusion in this gel memory foam is designed to dissipate that heat to help sleep a bit cooler. Microcoils – Below the comfort layer of memory foam and separated by a thin layer of transition foam sits a microcoil layer. 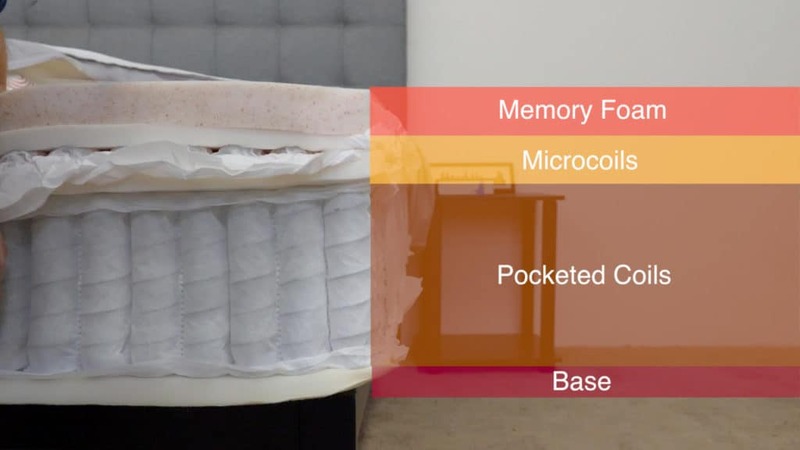 The microcoils will work with the memory foam to provide a bit more pressure relief but also give the mattress some bounce, so you won’t feel stuck in the mattress. Support – The support core of the Tuck consists of pocketed coils, which will provide some bounce to the mattress as well as some deep compression support for the sleeper. 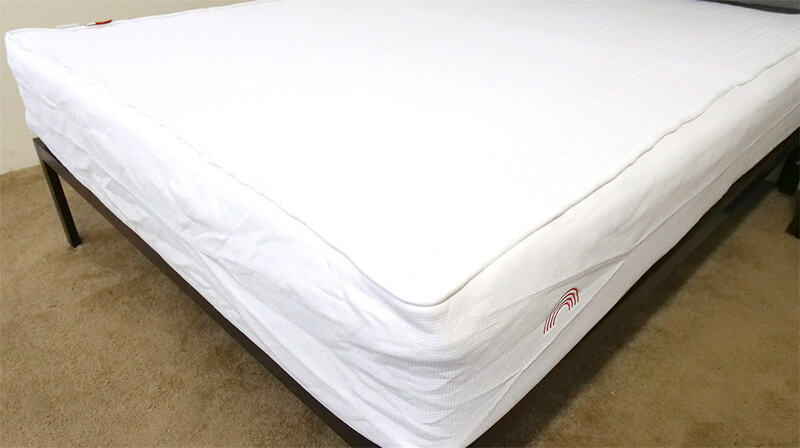 This layer will also help with temperature regulation as tall coils such as these create space that allows for airflow through the mattress. Another benefit of pocketed coils is their ability to isolate motion. Because of the fact that the coils are individually wrapped they tend to do a better job of dampening motion disturbance than traditional innerspring designs. Base – The base of the Tuck mattress is a layer of high density poly foam (1.8 lb density, IFD 41-62). This is a firm layer that mostly provides a foundation for the pocketed coils to rest on. The initial feeling I get when pressing into the Tuck is of the copper infused gel memory foam, which gives way pretty easily and provides a contouring feeling to my hand. When I added a bit more weight I began to interact with the microcoil layer and the bounce it provides. The quick response to pressure by the microcoil layer helps to defend against a stuck feeling from sinking into the memory foam. People of different body types and shapes will feel the firmness of a mattress differently. Rather than giving just my opinion on the overall firmness level of the Tuck, I brought in three other people to give their opinion as well. This will give you a better sense of the firmness range you can expect. The average of the four opinions on the firmness of the Tuck comes to just over 6/10. A score of 6.5/10 is generally considered to be a medium firmness, so this fits in line with Tuck’s description of medium support and firmness for my specific construction. I felt that the firmness was pretty close to medium, with maybe a hedge toward the firmer side, and gave the Tuck a 7/10. I found that the coil on coil construction provided good bounce and support while I was still able to sink in a bit for pressure relief. To give a visual representation of where someone may feel pressure points while lying on a Tuck mattress, I placed a pressure map on top and lied on my back, side, and stomach. On the image below pressure will be represented from blue (low pressure) to red (high pressure). My weight was evenly distributed while lying on my back and the pressure map shows low pressure across my entire body. I felt that the Tuck did a good job of supporting my weight in this position, keeping my spine aligned in a comfortable position. I did sink in a little and feel some contouring from the memory foam, but it’s a thinner layer and the microcoils below helped to keep me from feeling stuck in the mattress when changing positions. Once on my side I did feel an increase in pressure, which is expected due to a higher weight concentration over a smaller surface area. Side sleepers tend to prefer softer mattresses that allow them to sink in because of this increased pressure. I rarely sleep on my side and because of my position response on the questionnaire my Tuck was constructed to support me on my back and stomach more, leading to a medium to firm feel which is better for those positions. I would expect Tuck mattresses built for side sleepers to allow them to sink in deeper for pressure relief. I felt comfortable on my stomach, which is generally the position I sleep in. Stomach sleepers generally prefer firmer mattresses as they help keep their hips from sinking in and throwing their backs out of alignment. I found that the Tuck construction took my preferences into consideration here and did a good job of keeping my hips from sinking in. 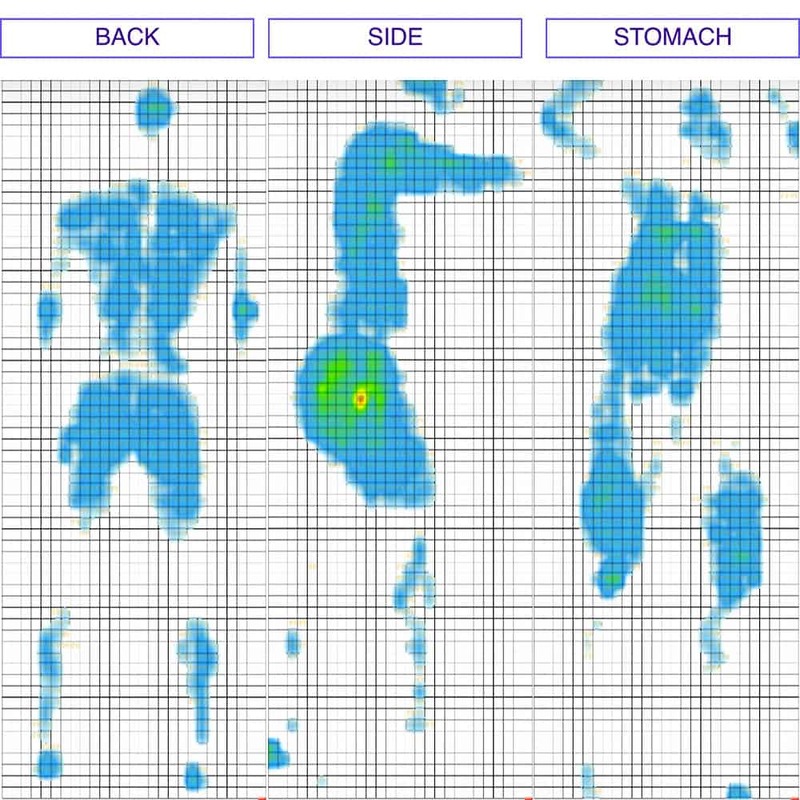 I should also point out that the pressure map results show low pressure across my body in this position, which is especially important at the chest as it allows me to breathe easily while on my stomach. If you are sharing the mattress with a partner, you will want to know what it will feel like when the other person gets into and out of bed or tosses and turns during the night. While my Tuck was constructed with only a single sleeper in mind, I still think this next test showing the intensity of motion detectable from one side of the mattress to the other is helpful. 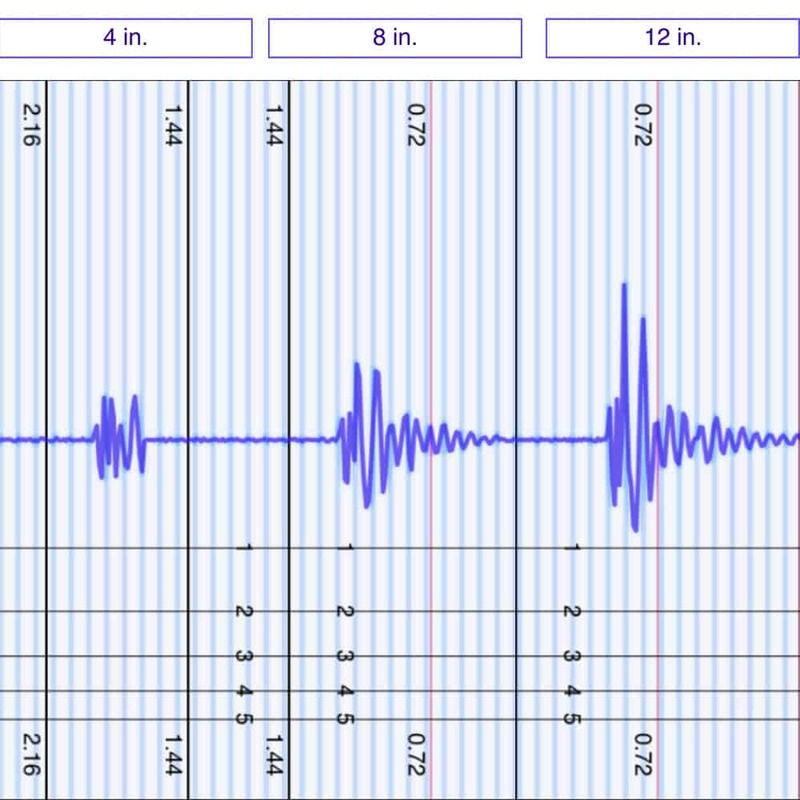 As you can see in the results above, the 4 inch drop caused very little disturbance across the mattress. This drop is meant to simulate someone changing positions on the other side of the bed and the Tuck performed really well here. The 8 and 12 inch drops represent someone getting into bed and the tuck again performs very well on these. 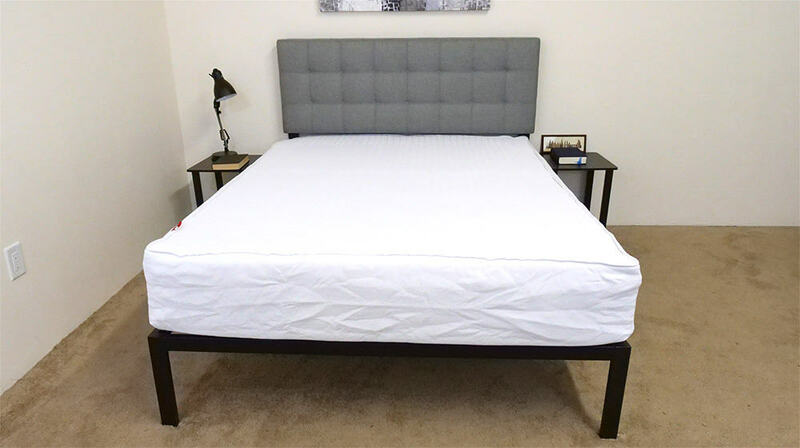 I would credit the memory foam and pocketed coils with helping to keep the motion transfer across the mattress down as both of these layers have qualities that help to dampen disturbance. Even though my Tuck was designed with only one sleeper in mind it still performed very well on this test. A lot of people will want to know whether they will feel like they are more on top of a mattress or as if they are sinking into it. In order to get a good idea of how someone might sink into the Tuck, I used four balls of varying sizes and densities (a 6 lb medicine ball, a 10 lb steel ball, a 50 lb medicine ball, and a 100 lb medicine ball) and placed them on the mattress to measure how much they compressed the surface. If you share your bed with a partner or roll around across the entire surface of the bed throughout the night then edge support can be very important. Supportive edges of a mattress allow people to sleep right up to the edge of the bed without feeling like they are going to fall out. 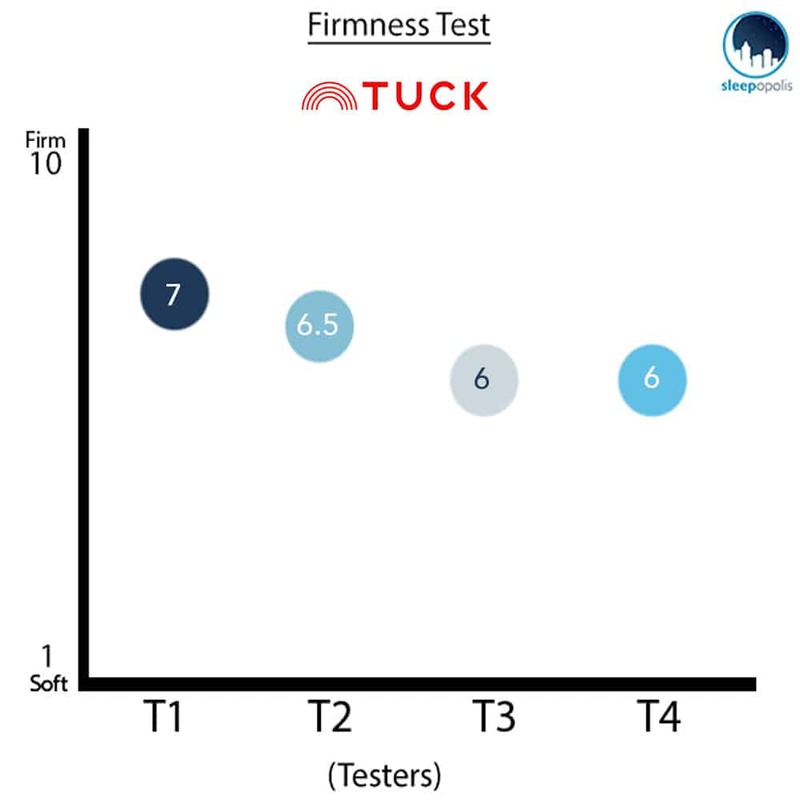 I was interested to see how the Tuck performed on this test as it is a bed in a box mattress, which struggle at times to match the edge support performance of traditional innerspring mattresses. Lying on my back near the edge of the mattress, the Tuck had an even feel with what I experienced near the center. As I moved really close to the edge the was some compression through the memory foam, which is to be expected out of softer foams, and you can see how the mattress contoured to my body in the picture above. When I rolled onto my side there was an increase in pressure in the position which caused me to push through the soft memory foam on top. Even with that compression I felt the pocketed coil system did a good job of supporting my weight near the side and I was secure in my position. Sitting up on the side of the bed, think putting your shoes on in the morning, may not be the most important position when selecting a mattress but I think shows what an increase in weight can do to the edge of the bed. With all of my weight over one portion of the Tuck I compressed the comfort layer and the microcoils, but felt that the pocketed coil system did a good job of supporting my weight. Warranty: Tuck offers a 11 year one month and one day warranty on the mattress. Shipping: Shipping is free and it will arrive compressed in a box. Is the Tuck Mattress right for you? Now that we’ve gone through some information about Tuck and put the mattress through some tests, it’s time to discuss who I think it would be a good fit for. Customizable – If you are looking for a new mattress and aren’t exactly sure what type of construction or feel you are looking for then Tuck’s questionnaire can make the process a bit easier. By answering some simple questions on their website, Tuck designs a mattress based on your preferences, so you don’t need to know exactly what you’re looking for in order to get a mattress that works well for you. 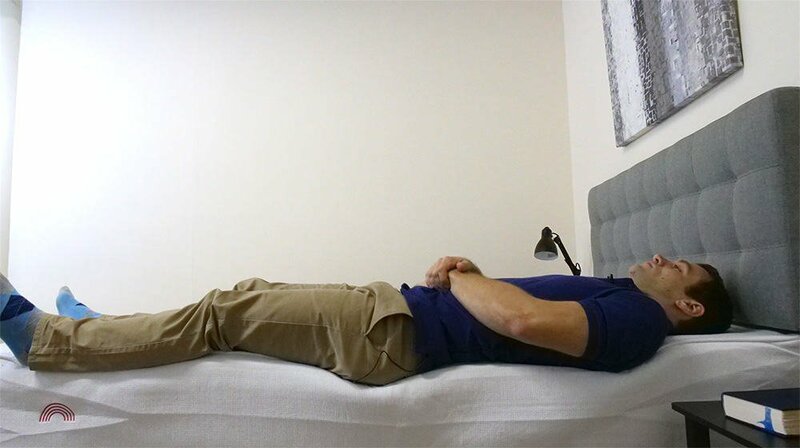 Couples – Even though my Tuck was designed with only one sleeper in mind it performed very well during the motion transfer test portion of the review. Tuck also offers buyers the ability to split construction of queen size mattresses and above, so that both sleepers can have a feel that best fits their preferences. Sleeps Cool – Tuck’s use of copper infused gel memory and latex foams help defend against the mattress trapping body heat. Also, by using a hybrid construction that includes a pocketed coil layer the Tuck creates space in the mattress for airflow, which helps with temperature regulation and cooling.